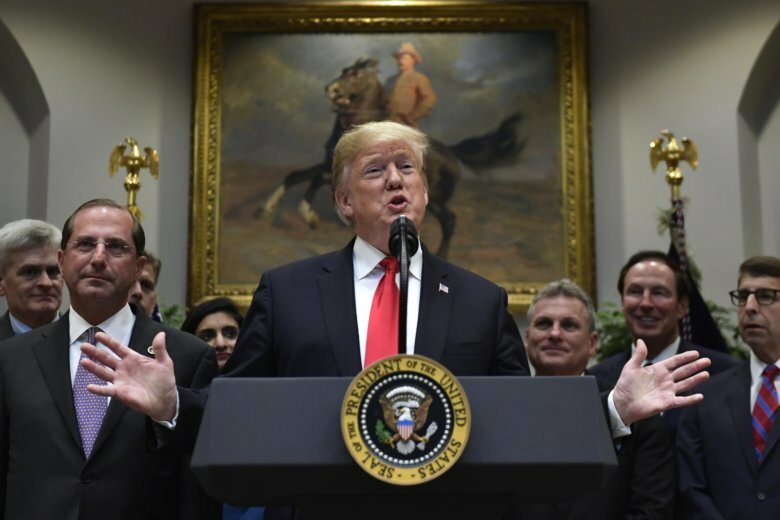 WASHINGTON (AP) — President Donald Trump took a big step into the debate over the future of America’s health care system with an op-ed column in USA Today that presented a bleak vision of what would happen under plans backed by many Democrats to institute government insurance for everyone. Trump on Wednesday cast the idea as a dangerous scheme by “radical socialists” as he played up potential pitfalls of a government-paid system without citing any of the benefits, such as the disappearance of most medical bills. THE FACTS: Some experts indeed foresee at least a possibility of such negative consequences, even if Trump’s account is overdrawn. He omits the intended upside, though, just as proponents of a government-run system gloss over factors such as the steep cost to taxpayers. America’s health care system is currently a hybrid, with employers, federal, state, and local governments, and individuals sharing the cost. Under “Medicare for All,” the federal government would take the reins. Seniors are being promised more health care from the government, not less. The plan by Sen. Bernie Sanders, the Vermont independent, includes benefits not now covered by Medicare such as dental, vision, and hearing aids. A House bill would also cover long-term care. The idea is also known as “single-payer,” because the government would pay nearly all the bills and set rates for hospitals and doctors — and for all patients, not just the elderly. “Medicare for All” would also eliminate or reduce costs now directly paid by seniors themselves. Retirees would no longer have to fork over premiums for supplemental private insurance to cover gaps in Medicare. There would be no deductibles. Copayments for most care would be eliminated. The same benefits would accrue to privately insured people. With almost no out-of-pocket costs, people would probably seek more health care services. There lies a potential problem. Single-payer would also dial back what hospitals and doctors now get paid for their privately insured patients, to a level based on Medicare rates. Medicare generally pays less than private insurance. The combination of greater demand for services and new limits on reimbursement would put a squeeze on the health care system. But would it “inevitably lead” to “massive rationing” as described by Trump? Academic experts critical of single-payer have been much more guarded. “It is impossible to say precisely how much the confluence of these factors would reduce individuals’ timely access to health care services, but some such access problems almost certainly must arise,” wrote Charles Blahous of the libertarian Mercatus Center in a recent analysis that pointed out cost problems with Sanders’ plan. Other experts and Sanders himself say that would not happen because single-payer would take costs out of the system by eliminating insurers as the middlemen and using government’s clout to bring down drug prices. “Our current dysfunctional health care system is designed to make huge profits for insurance companies and drug companies, rather than provide quality care for every man, woman and child,” Sanders said Wednesday in response to Trump. It’s early in the debate, and so far Americans seem willing to entertain the idea of a government health care plan. A survey in the spring by the nonpartisan Kaiser Family Foundation found that 59 percent of Americans would support getting coverage from a single government plan, with 38 percent opposed. Age made no difference in support for “Medicare for All.” Party affiliation was a factor, with Republicans opposed, Democrats strongly in favor and independents generally in favor. Pollsters say that support for single-payer is notoriously soft, and people can quickly change their minds once they start hearing about potential downsides. That might be why Democrats are also pitching another version of “Medicare for All.” This one would create a government-run plan that anyone in the country could join by buying into it, with taxpayer subsidies available. Private insurance and the current Medicare program would continue. —Trump put the cost of “Medicare for All” at $32.6 trillion over 10 years, calling it an “astonishing” figure. He actually underestimated the expected cost. He cited the added cost to the federal government of taking over private insurance, as estimated by Blahous. The total cost of the new system would be even higher. —Trump said Democrats have already “harmed seniors by slashing Medicare” to pay for President Barack Obama’s health care overhaul. He neglected to mention that when Republicans later won control of Congress, they kept in their own budgets the Obama Medicare cuts that they had campaigned against.